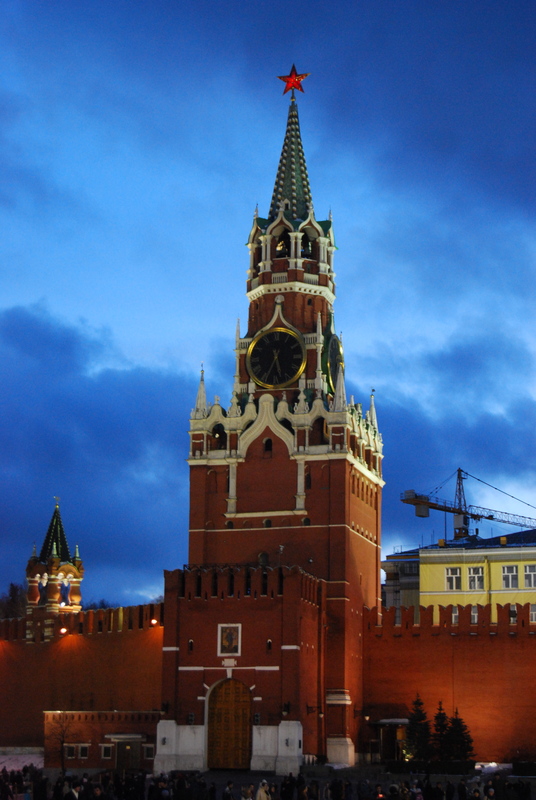 Had you told that twelve-year-old version of me that I would one day be standing, jaw hanging agape, in the middle of Red Square, I would have laughed you out of town. Me? In Red Square? 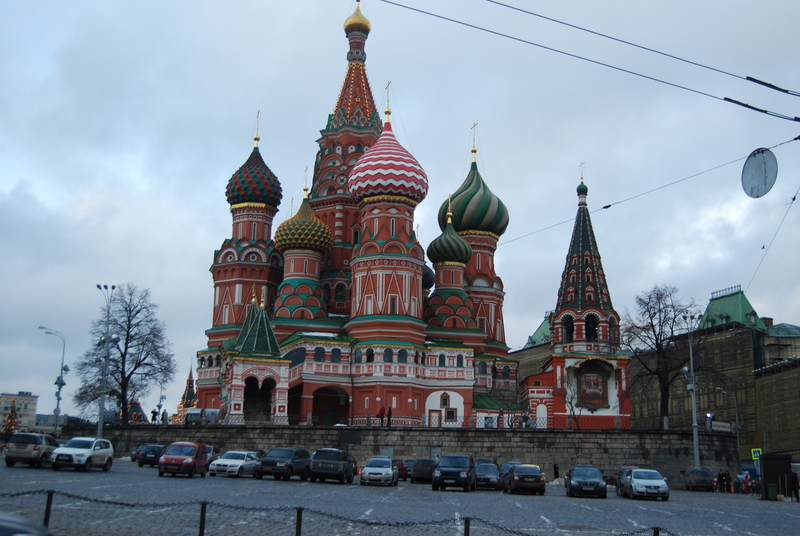 We clambered out of the bus and followed Yelena through a pedestrian underpass… and as I emerged with St. Basil’s Cathedral standing before me, I felt a lump in my throat. I had seen this cathedral in photographs all my life, and had always been struck by the beautiful, brightly colored Orthodox domes rising into the sky… but to see it with my own eyes was nothing short of amazing. For a few moments we stood near the cathedral, my eyes darting from one sight to another. To my left was the Kremlin Wall… and the Kremlin clock tower… and that strange, cubic pyramid-looking thing… why, that was Lenin’s grave. And that long, beautiful building to my right outlined tastefully in white holiday lights was nothing less than the GUM. I’m not usually the type of person to care about shopping malls, but the notion of a mall that dates backs to the 19th century was mind-boggling to me. As I stood there, trying to take in the full effect of being in a place that had always seemed so far away, I couldn’t help but recall how this had been a place of infamy for Americans (and the Western World) for a very long time. But standing in the shadow of St. Basil’s on those beautiful red paving stones, I was struck by only the beauty and the history of the place. That night, as I lay in bed, reflecting on the day’s events, I found myself once again pondering the idea of what makes a person an enemy… and what justifies hatred. Many of the people we were with were my parents’ age–and I’m sure, that like my parents, they had grown up being taught to hate the other. For my parents, the hatred was directed at the “Ruskies”. And for the good people we were spending time with in Tomsk and Moscow, the hatred was directed at the “Yankees.” For that matter, until my early teens, we were still watching movies like “Red Dawn“, and still worrying that the Russians were going to steal our freedom. So what changed? Or maybe there was a transformation. I am reminded of an insightful discussion we had in New Testament class in seminary. The debate centered around the story of the Syrophoenician woman in Mark 7:25-30. Jesus had come to bring salvation to the Israelites, and so when this Greek woman approaches him seeking the salvation of her daughter, Jesus brushes here aside with what felt like a rather crass comment, “It isn’t right to take the children’s bread and toss it to the dogs.” But this woman, who had basically just been called a dog, defends her right to ask for mercy. “Even the dogs under the table eat the children’s crumbs,” she said. Jesus found favor in her argument and offered her daughter healing. But what if Jesus’ discussion with that woman really had generated a transformation in his ministry? What does that say for us? Certainly not a single one of the Russians I met on my journey were an enemy to be condemned… but the adolescent version of me would have thought they were. And then the world began to change… and a transformation began to happen in my own soul. I began to question who were my enemies and why. I began to see a people in a whole new light. And my heart began to grow. Maybe Jesus’ mission and ministry transformed as he debated with the Syrophoenician woman so that we, too, could learn to transform our own narrow versions of mission and ministry. Just as Jesus opened his heart to offer salvation to one of “the others”, we too, are encouraged to open our heart and to see “the others” as our family. I don’t know how what sort of transformation happened in the lives and hearts of the crowd in Red Square, but I know that something deep in my heart and soul certainly transformed as this Appalachian preacher stood in the middle of Red Square: I learned to love a little more deeply. Amanda, I think you discovered the same thing I did on my first trip: people are people all over the world! And we are ALL in need of God’s love through Jesus Christ. It was a joy to get to know you on our trip.